Nut Roll - according to the minimal amount of research I did via Wikipedia - has a long history in Central/Eastern European cultures. 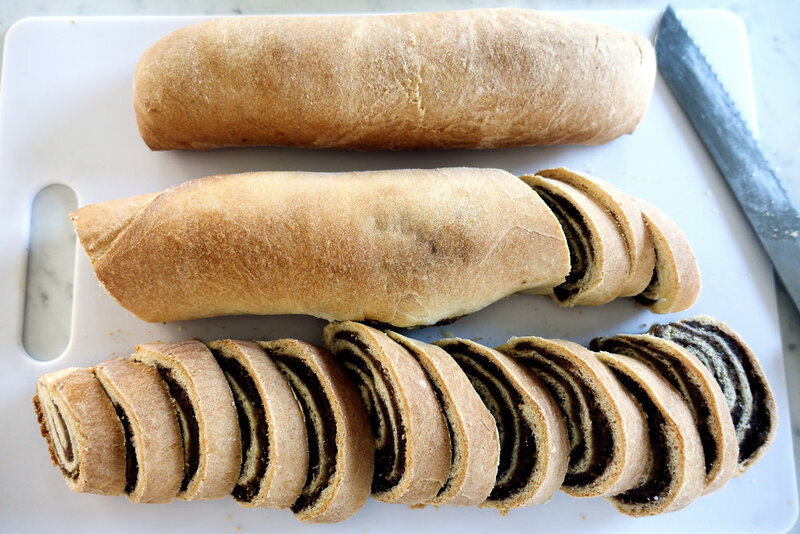 They come stuffed with a nut paste composed largely of either walnuts or poppy seeds (walnuts only in our family, thank you very much), and are served at key religious holidays. Because they came out in concert with other labor-intensive dishes like pierogi, I assumed they were difficult to make - boy, was I wrong. They are super simple, and now that I've made them once or twice, I'm eyeing up new flavor combinations and ingredient swaps (pistachios!). For now, I'll give you the basics. This recipe makes 3-4 rolls depending on how you roll out your dough sections. In my family, you had to eat your share as fast as you could lest you lose the slices to everyone else's grabby hands, but I find that in more civilized company this recipe makes more than enough and then some for large gatherings.. They freeze nicely wrapped first in Saran wrap and then in aluminum foil. Something to think about - many recipes call for apples or applesauce as an ingredient in the filling to replace some of the other sweetener. I have left this out because I have no recollection of my grandmother ever using this, but I'll try it on my next batch to see what it does to the flavor. 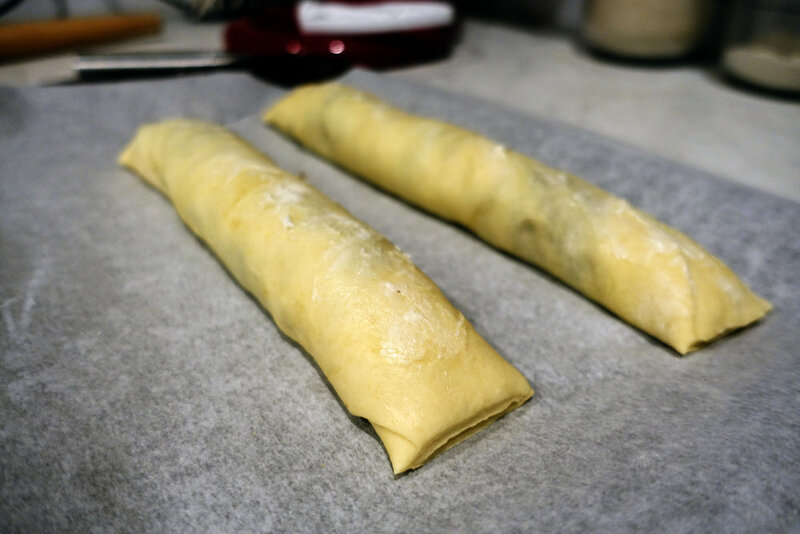 Cut in cold butter as you would for pie dough, via food processor, forks, with your fingers, or with a pastry cutter. Add your eggs and hook this up to a stand mixer for a good blend. Add yeast and warm water. Mix again until a dough forms. Once this is in dough condition, switch out your mixer attachment to the dough hook and give it a good knead until the dough is soft and workable and pliant. You can also do this by hand in 4-5 minutes of strong kneading on a floured surface. 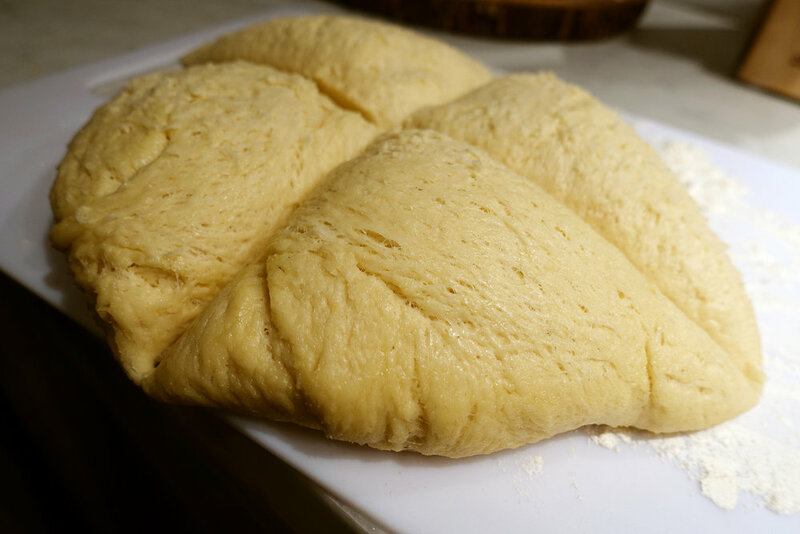 Let your dough rise until doubled. Toast up your walnuts, either in a dry pan on the stove top or on a sheet pan in the oven. This takes 5-10 minutes and you know they're toasted once they smell toasted and delicious. When cool, dump them in your food processor with the 2 tbsp of softened butter, honey and sugar and pulverize them - stop when they are crumbled, but before they turn into nut butter. Drizzle a little bit of milk in as you go to make a spreadable paste consistency. It took me a few tires to get this right because I was afraid of making it running. Don't be scared! Stop your food processor and give it a taste. Do you want to add some spices? Some salt? More honey? Technically the recipe I am using says to "add honey until it is over-sweet" so have at it if you like. Once you rough is risen, (like the proverbial Lord, for our Easter observing friends! - for bonus points I will tell you that this is an incorrect use of the word "proverbial" because Proverbs is Old Testament and no one was doing any rising in those chapters), I divide mine into four sections with my bench knife and then proceed to eat about 25% of each section because this dough is pillowy and delicious and I could eat it until I explode. Rather than exploding, I grab a chunk and roll it out as thin as I can get it before it tears on a floured silicone baking mat. I am enormous devotee of this one in particular, which is both great for pasty rolling (and measuring) and for sticking in the oven and using as a baking sheet. It is possibly my most favorite baking tool. Once rolled out as thin as you can - don't be afraid to patch up tears with some extra dough, don't be precious about it - dump some of that filling in there and cover the entire surface as best as you can. We're going to roll this up tightly like a jelly roll, and then I like to flip off the ends with my bench knife (partly to seal them and partly so I can eat more dough). Brush them with a beaten egg for a nice crust if you're feeling fancy or don't if you're me and you used your last egg in to the dough itself. Bake in the oven for 300 minutes at 350 degrees on parchment or a baking mat. Take out when the crust is a marvelous golden brown. Let them cool, and then dive in.